Due to the large diameters and thin sections of these bearing products, it is necessary to address measurement and inspection techniques. To accurately measure the bore and outside diameters of thin section bearings, a specific procedure must be followed. Appropriate measuring equipment must be used which will allow the inspector to take 3 to 5 readings around the circumference which are then averaged to determine the true measurement of the bearing in the free state (unmounted). This procedure allows for the inherent out-of-roundness these bearings will exhibit. When measuring these bearings, special care must be exercised to ensure neither the bearing weight or pressure from the measuring equipment affects the measurements. If thin section bearings are being installed into a housing, pressure should be applied only on the outer ring. Bearings to be installed on a shaft should be pushed on the inner ring. Since the majority of Silverthin bearings are open (without seals), a clean, contaminant-free installation area is advised. 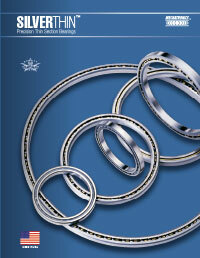 Rolling element anti-friction bearings rely on ball and raceway surface lubrication. A thin film of oil or grease should be used. Be sure not to contaminate the lubricant used in the bearings. Our standard open (unsealed) bearings are shipped with only a light oil as a corrosion inhibitor. You must lubricate these bearings with the appropriate grease or oil for your application. Sealed bearings are shipped as standard practice with 20% - 30% fill of Mil-G-81322 grease. Information listed in this catalog such as load ratings and bearing dimensional data has been compiled from industry standard data as well as ABMA and ANSI information and formulas. Technical information and ratings have been modified from empirical data and test data from Silverthin.TM Load capacities show in the catalog are not additive. For combined radial and axial loading an equivalent radial loading must be calculated. Thin section bearings are affected by the tolerance, roundness, and expansion & contraction rates of the housing & shafts used to mount these bearings. The "Precision toler-ances & Recommended Fits" shown in this catalog are for bearings with standard diametral clearance and steel shafts & housings. Bearings with special clearances or preloads and those which are mounted in, or have shafts in, materials other than steel, will need special internal clear-ance consideration to account for different expansion & contraction rates of dissimilar materials. NTDC nodular thin dense chrome plated bearing rings of 52100 steel are designated with an “A” in the Silverthin part numbering system. This electro-deposited chrome plat-ing process will not chip, crack or peel under severe stress experi-enced in bearing raceways. This process increases bearing corrosion resistance, improves surface hard-ness to the Rc70-Rc78 range which in turn reduces bearing friction and helps retain lubrication. We apply this plating to our standard 52100 steel inner and outer rings so allowances must be made to standard housing and shaft fits to allow for the plating build up on the exposed surfaces, especially the bore and outside diameter. The plating build up per surface can generally be from .000040 inch to .00015 inch. 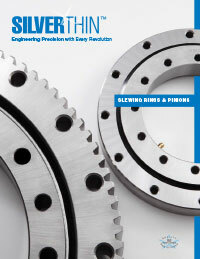 Contact Silverthin Bearing for bore and shaft fits.